Booth 2: Charles Smith/K Vintners – Eve Chardonnay was a nice well rounded example. Also learned that Kung Fu Girl (a must try for Riesling fans) has had production to support year round availability for the last two years and that should continue going forward. Booth 3/50: Rieslings and Grüet Bubbly are nice breaks in the middle of a large red run to help refresh the palate. All the Loosen offerings are good with the Dry Riesling being a different take on the standard offering. Booth 15/22/68/98 – There are some nice high end red wines in the Grand Tasting Room. Expect a longer than usual line for Orin Swift, JAQK, Mollydooker, and Cinq Cepages. All were showing nicely in the afternoon and might be worth a slightly longer wait for red lovers. New to me this year was Hoepler Estates out of Austria. Christof Höpler is in attendance to answer any questions you have about Austria, their national grape (Grüener Veltliner), or the other wines he brought. Overall I was impressed by his Pinot Noir in addition to the Gruner and Blaufränkisch. Also, the Frederick Wildman, & Sons table (booth 118) was a “new-to-me” importer that was able to give me a few good examples of their portfolio. Tasting through their red offering was well worth the time. They’ve been attendees in the past, but this was the first year I spent time sampling their offerings. A few favorites were also there: Veleta (booth 56), JAQK (booth 98), Terry Theise (Booth 12), Henke (booth 125), Burnet Ridge (booth 127), Firelands (booth 59), Moet Hennessy (Pinot Meunier booth 116), and Justin (booth177). Terry Theise has a Pinot Meunier driven bubbly; the Aubry Brut, which can be used as a nice comparison to the still version at Moet. Overall. my impression is that the Wine Festival will be a great time for wine lovers looking for something to do this weekend. There is a nice mix of new and old favorites that should keep everyone expanding their palates. If you go this weekend, post any favorites in the comments below! Welcome to Wine-Girl’s Annual Wine Festival Survival Guide. Every year I poll a large group of wine bloggers and find out if there are any outstanding tips, which I add to my own. This year, I’ve added new tips based on my experience pouring wines for the last two years. I’m sad to say that I’m missing the Wine Festival for the first time in years. It makes me sad, but it snuck up on me and I’m currently in San Francisco. I’m leaving Festival reporting to the capable hands of Kevin, Cresta, and Angela. Consider a designated driver, cab service, or even a hotel room. Last year we decided to succumb to an afternoon and evening of alcohol and we got a hotel room. The Wine Fest web site offers several hotel packages downtown, and we often find great last minute deals at The Cincinnatian. In past years, we’ve had good luck booking through Hotwire. Make a game plan. First, download the Tasting Guide ahead of time. In the guide, you can find the list of attending wineries, the corresponding floor plan, and the list of wines in the Special Tasting Room. Plan ahead. See what looks interesting. Accept that you can’t possibly try everything. You may want to decide to divide and conquer within your group of friends. – Carry your own spit cup. Dixie cups work, as well as those Solo plastic cups. When a table is crowded, it’s hard to get to the bucket, nor do you want to be in someone else’s spit stream. Also, it’s easier to be discreet when you are quietly spitting into your own cup. – Dump instead of spit. I don’t spit at the Wine Festival. When I’m judging a wine competition, it doesn’t bother me to spit into a personal cup. But in our weird lack-of-spitting city, I get really self-conscious. So I take a small sip or two, try to really glean something out of it, and dump the rest of the wine into the bucket. It’s expected. You’re not wasting wine or hurting anyone’s feelings. And finally, don’t expect your friendly wine blogger to get you free tickets. Even Kevin & I pay to get in to the evening events. It’s a charity function. In fact, I believe 50% of your ticket is a tax-deduction as a charitable donation. So don’t try to get in free and skimp on those charities, okay? Instead, just go and have a fantastic time! If you haven’t purchased your wine festival tickets yet, head on over to Winefestival.com. 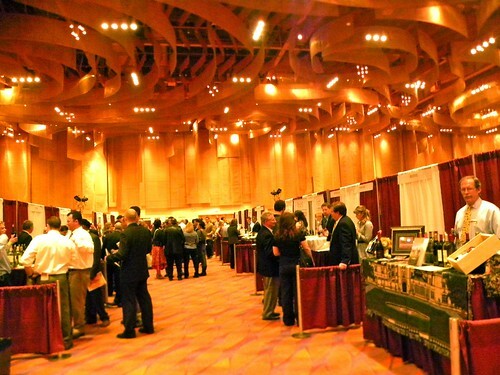 The Cincinnati Wine Festival is one of the best in the nation and draws high-end distributors and winemakers. You shouldn’t miss it. Additionally, the Wine Festival organizers have put the wine tasting floor plan online for you to download. It’s a bit hard to find on their site, but you can download it through this link. Dilly Cafe is having its own series of events starting this Saturday, where you can meet 3 winemakers in 9 days. 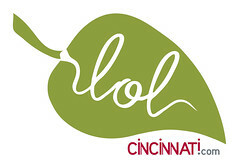 For more information, visit their web site or call 513.561.5233. Not all of the Wine Festival sponsored winery dinners are sold out just yet, and this year five of the dinners are featuring Vintner Select, which is a local and excellent wine distributor. In attendance at each of the dinners to talk about the highlighted wines will be a special guest from the winery or specific wine portfolio (Spain or Italy), as well as a Vintner Select representative. All of the dinners start at 6:30 p.m. and will be held at different restaurants around the city. Ticket prices range from $125 to $150 per person, plus tax and gratuity. Reservations for each dinner are required. For more information on the menus and to make reservations, click here.